Can your business afford to lose information? Your business runs on information. You need to ensure continued access to that information if you want to stay in business. That’s why you need cloud backup. Data loss can be caused by many things ranging from employee error to computer viruses to hardware failures to file corruption to fire, flood, theft, etc. Data backups are copies of your files that you create in case you lose your data. Good data backup practice also forms the backbone of your business' ability to recover from a disaster (and a disaster is ANY event that makes your business stop operations for any amount of time). If you think that because you've got “backup files” set up on your laptop that you have a data backup plan, you're doing it wrong. Backed up information needs to be stored in a separate location – best practices require a second, redundant location. Many businesses keep their backup tapes in their server room next to their backup drives. That's not a backup strategy. Those issues don't happen with an outsourced backup solution. 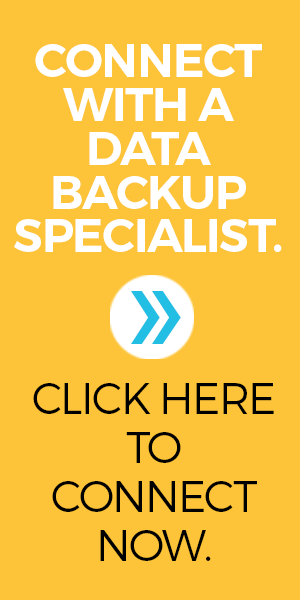 AIS provides secure, redundant data backup for your critical business data. We ensure that you maintain access to your critical financial, customer, and company data. Data preservation and the ability to retrieve data at any point in time from any location is the foundation of business continuity. A backup solution is the backbone of strategic planning that keeps your business running in case of a disaster. If you aren’t worried about backup, read on. By the end of this list we think you’ll agree that investing in data backup is good business. In the past two years, Over 50 % of businesses experienced an unforeseen interruption, and the vast majority of these interruptions caused the business to be closed one or more days. In the case of suffering a fire, 44% of enterprises fail to reopen and 33% of these failed to survive beyond 3 years. Companies are still failing to put strategic contingency plans in place. Analysts from Hughes Marketing Group have found that over the course of a month, 90% of small companies (fewer than 100 employees) spend less than 8 hours planning or managing their business continuity plans. Vendors offering disaster recovery solutions have stated that between 60% and 70% of all problems that disrupt business are due to internal malfunctions of hardware or software, or human errors that may lead to fraud. According to Timesavers International studies, the catastrophe most businesses experience is not fire, flood, or earthquake, but rather something much more insidious—malware. In 2014, the United States was the top country for overall malicious activity, making up 23% of the total. Companies that aren’t able to resume operations within ten days (of a disaster hit) are not likely to survive. Convinced? We look forward to talking with you. Click here to schedule an IT assessment.